Known for epic vistas, dramatic natural settings, and imaginative landscapes, Thomas Cole’s work depicts nature at its most powerful and vulnerable. His paintings glory in the unique terrain of the American Northeast – largely still unspoiled in his time - while serving as a cautionary tale about the use of natural resources in an increasingly industrial age. The exhibition includes 58 works, the majority on loan from North American collections. It includes Cole’s iconic painting cycle, 'The Course of Empire' (1834–6, New-York Historical Society) and the masterpiece that secured his career and reputation – and which has never been seen in the UK before - 'View from Mount Holyoke, Northampton, Massachusetts, after a Thunderstorm - The Oxbow' (1836, Metropolitan Museum of Art, New York). Cole’s paintings are shown alongside works by British artists with whom he was personally acquainted, as well as those who influenced him most, including JMW Turner and John Constable. A self-taught artist from Bolton, Cole is recognised as the father of landscape painting in the US. His career was shaped by his formative years labouring in the textile mills north of Manchester, and by his later study of the European masters whose works he travelled to see in London, Paris, and Rome. Christopher Riopelle, The Neil Westreich Curator of Post-1800 Painting at the National Gallery, said, "Cole is not as well-known here as in America, where his works are hugely admired. The story this exhibition tells, however, is a fascinating and novel lesson in international artistic exchange. A young émigré returns to Britain and travels on to the Continent to learn about contemporary European landscape painting and then carries the lessons home where, almost single-handedly, he forges the American landscape tradition." At the age of 28, Thomas Cole and his American patron, Luman Reed - a successful businessman and one of the earliest collectors of European and American art in the US - agreed it was time for him to take a study trip to Europe, beginning with London. Just a decade after leaving England to pursue a better life, he would return as a professional artist seeking to refine his technique and broaden his horizons though the great collections, and by associating with the most celebrated artists working at the time. At the National Gallery, which he visited, Cole was particularly enraptured with the work of Claude, especially Seaport with the Embarkation with Saint Ursula (below), which is included in this exhibition. Not long after arriving in London, the young artist saw 'Hadleigh Castle, The Mouth of the Thames - Morning after a Stormy Night' (1829, Yale Center for British Art, New Haven) by Constable, with whom he developed a friendship and exchanged letters and sketches. An admirer of Turner, Cole visited his studio, but was somewhat confounded by the image the artist presented of himself. A bit rough around the edges and artistically experimental, Turner did not resemble the image Cole had of an artist of international repute. Cole had hoped to make a successful debut for himself exhibiting his paintings of American landscapes in London, but was met with a frustrating indifference from the city’s art elite, and so decided to move on to the Continent. Arriving in Florence in 1831, Cole spent a productive eight months studying the figure and honing his plein-air sketching skills in the company of a small community of American artists. Drawn to the countryside favoured by Claude, he later spent several months in and around Rome. Working outdoors, he sketched an aqueduct in the campagna and the picturesque town of Tivoli, both of which feature in paintings he completed back in his Florentine studio including 'A View near Tivoli (Morning)' (1832, The Metropolitan Museum of Art, New York) and 'Aqueduct near Rome' (1832, Mildred Lane Kemper Art Museum, Washington). The landscape, antiquity, and likely the camaraderie he found, were a rich source of inspiration for the rest of Cole’s life. In the five years following his return to New York late in 1832, Cole painted his greatest works in response to his time abroad. Working from drawings and oil studies, he completed his epic painting cycle 'The Course of Empire' and 'The Oxbow' almost simultaneously in this period - both of which may be seen as the culmination of what he took away from his experiences in London, Florence, and Rome. 'The Course of Empire' depicts the rise and fall of an imaginary civilisation in an ancient style, but was intended to highlight the dangers of politics and commerce. It could not have been made but for those months in Italy. 'The Oxbow' was a challenge to the American public to consider its place in the natural world, and to keep in check the seemingly inevitable drive toward destruction. Before his untimely death in 1848 at the age of 47, Cole launched the first American school of landscape art by addressing the subject of a new country’s development with respect to its relationship with nature. 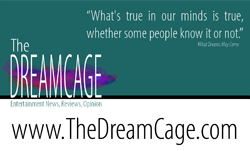 Ultimately, generations of artists were influenced by Cole’s vision and resonance with the natural world, although they went in different philosophical directions with the changing of the times. Frederic Edwin Church, a key figure in the Hudson River School of painting, and Asher Brown Durand were devoted students of Cole, both of whom created works in homage to their mentor – Church’s 'Above the Clouds at Sunrise' (1849, Private Collection) and Durand’s 'Kindred Spirits' (1849, Crystal Bridges Museum of American Art) both specifically reference Cole’s passing and are seen in the exhibition. 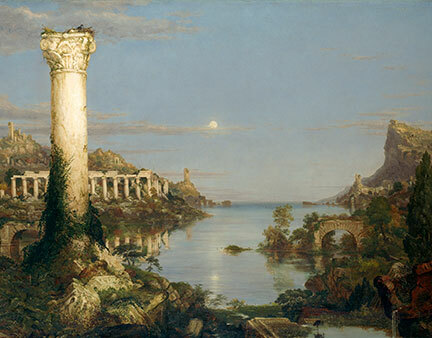 Dr Gabriele Finaldi, Director of the National Gallery, said "Thomas Cole’s passionate engagement with the landscape of the recently established United States marks a new beginning in American painting. Inspired by the European tradition of Claude, Turner, and, Constable, Cole depicted the unspoilt beauty of the American landscape but he also prophesied the dangers of an encroaching urban and industrialised society on it. His concerns remain highly topical today." In Room 1, a concurrent exhibition Ed Ruscha: Course of Empire displays a cycle of ten paintings by the renowned Los Angeles artist (b. 1937), which responds to Cole’s 'The Course of Empire'. More than one hundred and fifty years later, Ruscha offers a contemporary answer to the questions Cole first raised about the fate of a society out of balance with nature. Image - Thomas Cole, The Course of Empire: Desolation, 1836. Courtesy of the New-York Historical Society © Collection of The New-York Historical Society, New York / Digital image created by Oppenheimer Editions.